White Carrara marble farmhouse sink carved from real white Carrara marble. This is a great addition to any home especially a traditional or arts and craft style home. 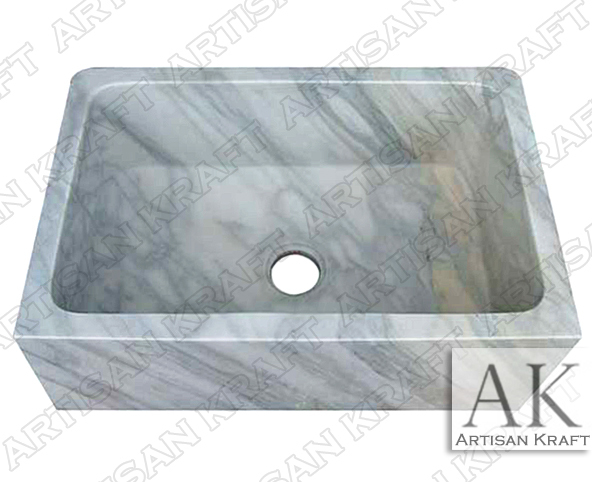 A white Carrara kitchen farmhouse sink can easily follow with the decor in a modern or contemporary home as well. Gray veining adds so much beauty to the white marble. Choose from a large variety of natural stones such as limestone, marble and travertine. Natural stone sinks are the great addition to a beautiful kitchen. We have a great variety of copper sinks and bathtubs as well. Farmhouse sinks carved in marble are an ultimate statement for the home. Farm Sink Dimensions: 30″ x 18″ x 8″ The dimensions can be adjusted.